2 8 • O U T PA T I E N T S U R G E R Y M A G A Z I N E • J u N E 2 0 1 8 2 0 1 8 P R E V I E W M illennials — the term created for the 18- to 35-year-olds that are filling the workforce — often follows some snarky commentary about snowflakes and iPhone use. 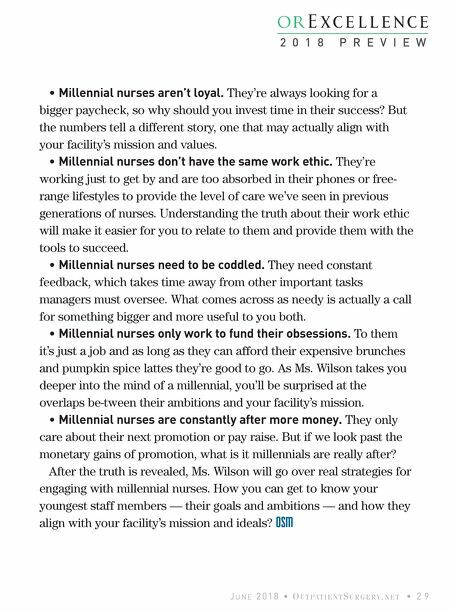 The situation is no different for millennial nurses. No matter what generation you are from, it's highly likely you've participated in or been the topic of discussion about these entitled nurses. But here is the truth. 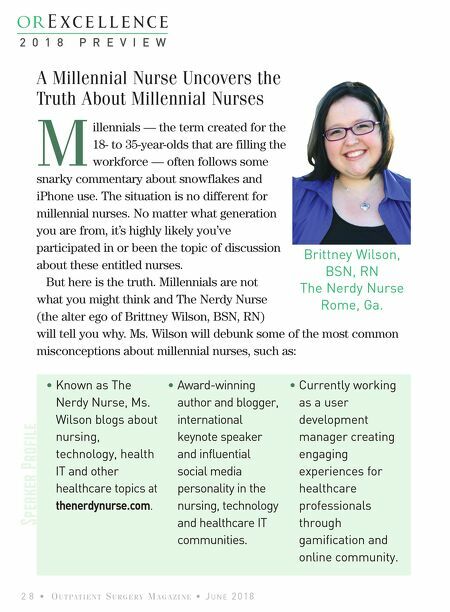 Millennials are not what you might think and The Nerdy Nurse (the alter ego of Brittney Wilson, BSN, RN) will tell you why. Ms. Wilson will debunk some of the most common misconceptions about millennial nurses, such as: • Known as The Nerdy Nurse, Ms. Wilson blogs about nursing, technology, health IT and other healthcare topics at thenerdynurse.com. • Award-winning author and blogger, international keynote speaker and influential social media personality in the nursing, technology and healthcare IT communities. • Currently working as a user development manager creating engaging experiences for healthcare professionals through gamification and online community. Speaker Profile A Millennial Nurse Uncovers the Truth About Millennial Nurses Brittney Wilson, BSN, RN The Nerdy Nurse Rome, Ga.